Wondering where to stay in Budapest and considering the Kempinski Budapest? Our hotel profile outlines the Kempinski’s location, amenities and room types and will help you decide whether this 5-star luxury hotel is right for you. The Kempinski Budapest is one of Budapest’s 5-star hotels. It’s part of one of the oldest luxury hotel groups in Europe. Located right in the heart of Budapest in the 5th district, Kempinski Hotel Corvinus has a wide range of facilities. 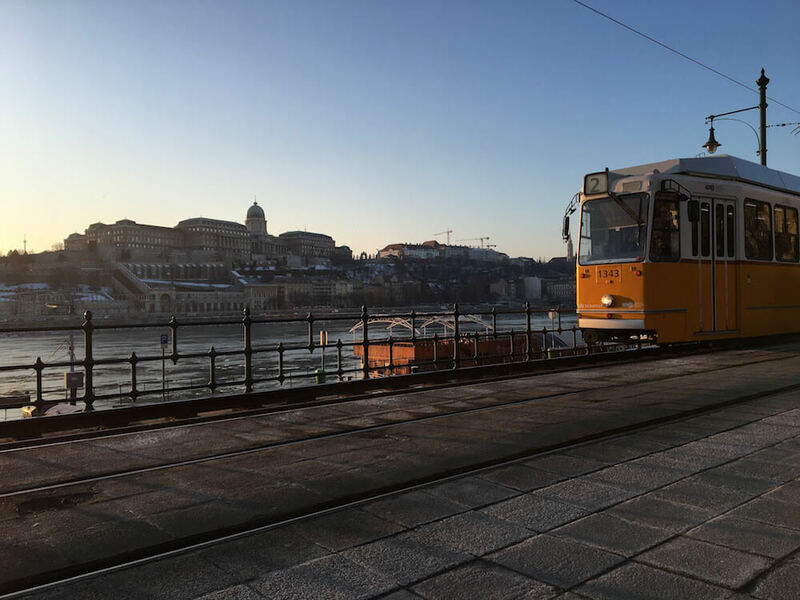 Because of it’s commitment to luxury and location in one of the best areas to stay in Budapest, it’s a great choice for anyone on a business trip, a family trip, or a romantic getaway. Who Will Love the Kempinski Budapest? The Budapest Kempinski is both family-friendly and pet-friendly (cat and dog only). The hotel offers children’s amenities such as baby cots, children’s toiletries, and bottle sterilizers. It also offers dog and cat beds and bowls! 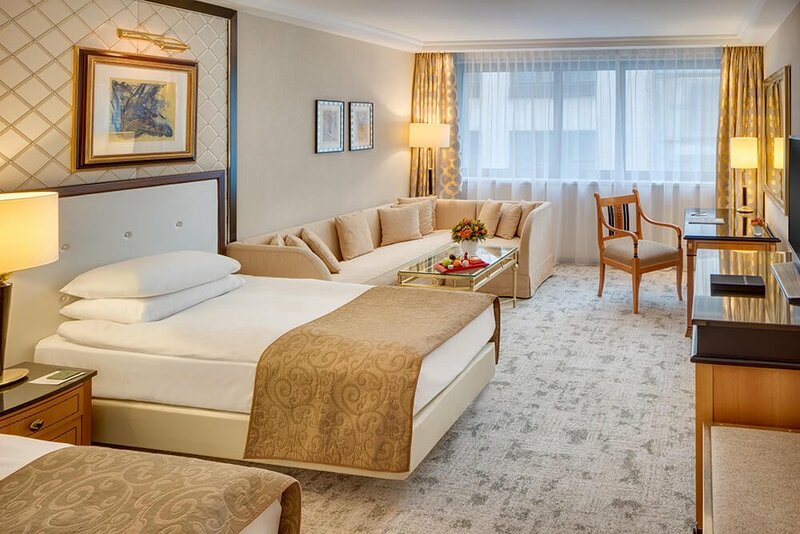 The Kempinski Corvinus can accommodate all types of travelers, whether you’re traveling solo on business or plan to bring the kids and cat along. It’s a great luxury choice. 7-8 (ter is Hungarian for square). 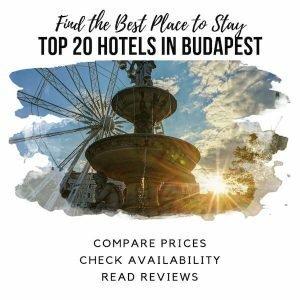 We consider the 5th district to be one of the best areas to stay in Budapest overall. A private pick-up from the airport be arranged with the hotel or with private companies in advance. The Taxify app is also useful if you plan to have cellular data (4G/LTE) during your stay. Budapest doesn’t have Uber, but Taxify works more or less the same. Use the code WNDR2TH to get 500 Ft. toward your first ride. Otherwise, a taxi (about €25) or a miniBUD Shuttle bus (about €10 per person) will get you to the hotel relatively quickly from Liszt Ferenc Airport (BUD). Both options take about 30- to 40-minutes driving, but you may have to wait for the miniBUD to fill up with other passengers. There is also a public Airport express bus which takes you to Deak Ferenc ter, 4 minutes’ walk from the hotel. The airport bus takes approximately 45 minutes and costs Ft 900 (roughly €2.75). Click here for further details about getting from Budapest airport. There are three main train stations in Budapest. You’ll most likely arrive at Keleti Palyaudvar if you’re coming from Vienna or Prague. Taking a taxi from Keleti to the hotel should cost €5 to €10 and take about 10 minutes. While the rooms offer a peaceful and quiet atmosphere, the super central 5th district is located is always full of life. Budapest’s Fashion Street is just around the corner from the hotel, with restaurants, souvenir shops, and clothing stores that range from fast fashion to high-end luxury. Past Fashion Street and within a 5-minute walk is the UNESCO-listed Danube Promenade. The Danube Promenade is a short walk from Kempinski Budapest. 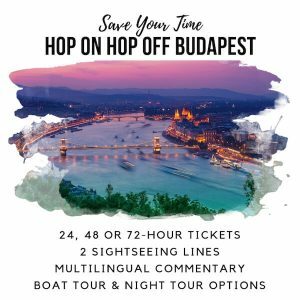 Major attractions near the area include St Stephen’s Basilica (8-minute walk), Andrassy Avenue (5-minute walk), Hungarian Parliament (15-minute walk), and the Chain Bridge (10-minute walk). All can be accessed by public transportation and taxi as well. In the evenings, head to the river for a quiet and pleasant evening outside. Alternatively, walk in the opposite direction across Karoly korut (korut means boulevard in Hungarian). There, you’ll find the historic Jewish quarter of Budapest (7th District), which is also Budapest’s nightlife district. Kempinski Hotel Corvinus opened in 1992. The exterior and interior of the hotel are modern. The hotel consists of 351 rooms, with 35 suits. Rooms have either a contemporary or classic, old world elegance aesthetic to them. Some rooms and suites were refurbished in 2018. These rooms have a much more contemporary look to them, and are noted as “deluxe” rooms. All rooms and suites feature air conditioning (Budapest gets very hot from May to August) and soundproofing. Rooms have elegant bathrooms with either a shower, bathtub or both, hair dryers, flat-screen TVs, safes, a desk, and your choice of pillows via a pillow menu. Superior Rooms: The 28- to 32-square-meter Superior Rooms offer either a double or queen bed, spacious private bathroom with a shower or a bath, and have a view of either the inner courtyard or neighbouring streets. 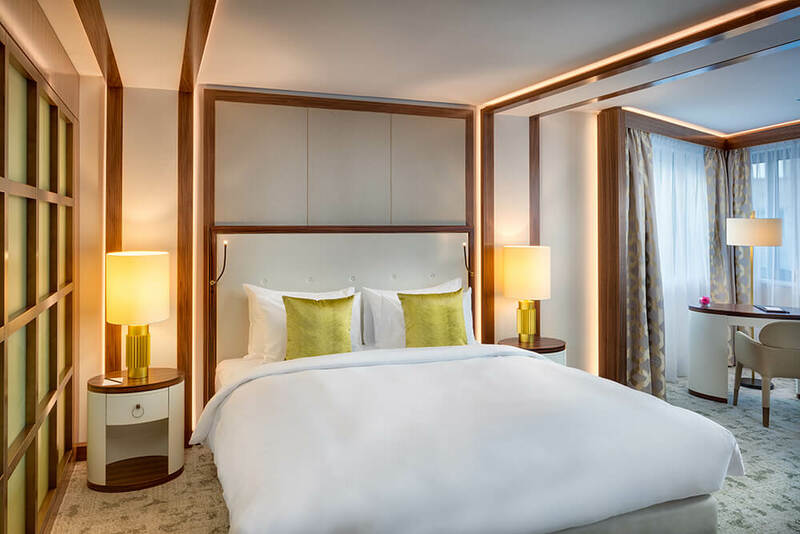 Premium Superior Rooms: Similar to the Superior Rooms, the 28- to 32-square-meter Premium Superior Rooms were recently refurbished to have a more contemporary aesthetic. These rooms offer either a double or queen bed, bathroom with either a shower or a bath, and also overlook either the inner courtyard or neighbouring streets. Deluxe Rooms: The 28- to 35-square-meter Deluxe Rooms offer a classic decor and a spectacular view overlooking Erzsebet ter or nearby streets. They feature luxury queen, king, double or twin beds and bathrooms that include both a shower and a bath. Some of these rooms come with connecting doors, a great choice if you’re traveling as a family. Premium Deluxe Rooms: Similar to the Deluxe rooms, the Premium Deluxe rooms were recently refurbished. These 28- to 35-square-meter rooms feature a queen, king, double or twin bed and a bathroom with both shower and a bath. Some of the rooms come with connecting doors. 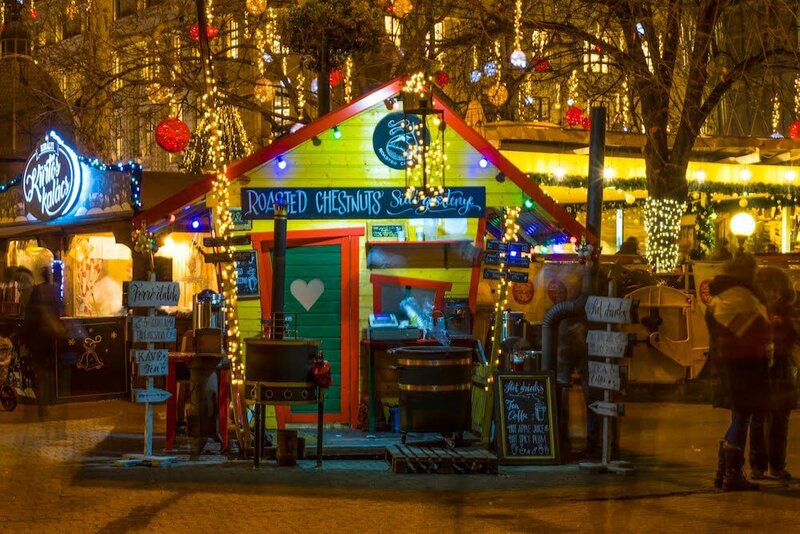 Photo Courtesy of Kempinski Hotel Corvinus Budapest. Used with permission. Grand Deluxe Rooms: With increased space, these 35- to 43-square-meter classically designed rooms have soft pastel colors and overlook Erzsebet ter or the neighborhood streets. Bed choices include double or king, and the bathroom features a shower and a bath. Rooms also include a Nespresso coffee machine. 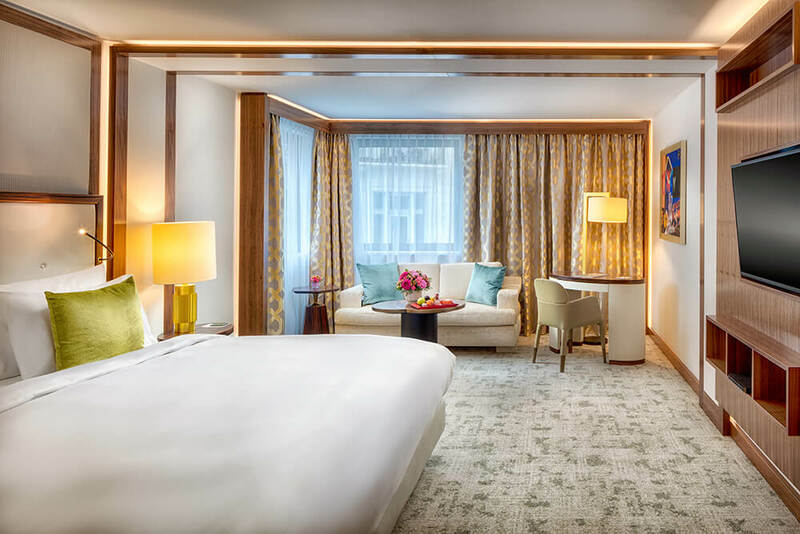 Premium Grand Deluxe Rooms: Similar to the Grand Deluxe Rooms, these premium rooms were recently re-designed by British designer Alex Kravetz to offer a more contemporary and luxurious look. Rooms overlook Erzsebet ter or the neighborhood streets. Rooms have a king bed, a shower and a bath, and a Nespresso coffee machine. Junior Suite: These 43- to 65-square-meter rooms offer the hotel?s classic interior and a view over Erzsebet ter or the neighborhood streets. The space is separated between a bedroom, which has a king bed, and a lounge area with a sofa, a coffee table, and a private bar and Nespresso machine. Bathrooms have both a shower and a bath. Premium Junior Suite: Similar to the Junior Suite, the Premium Junior Suites were recently reimagined by British designer Alex Kravetz to offer a more contemporary look. These spacious 45- to 65-square-meter rooms offer a king-size bed, a lounge area with a sofa and a coffee table, and a bathroom with a bath and separate shower. These rooms also have a Nespresso coffee maker and a private bar. Parlour Suite: The 58- to 65-square-meter Parlour Suite offers the hotel’s classic design scheme, and views over Erzsebet ter or the neighborhood streets. A separate bedroom with a king or double bed, living room with sofa and entertainment center, and 2 bathrooms allows more space and privacy for guests. These rooms also have a Nespresso coffee maker and a private bar. 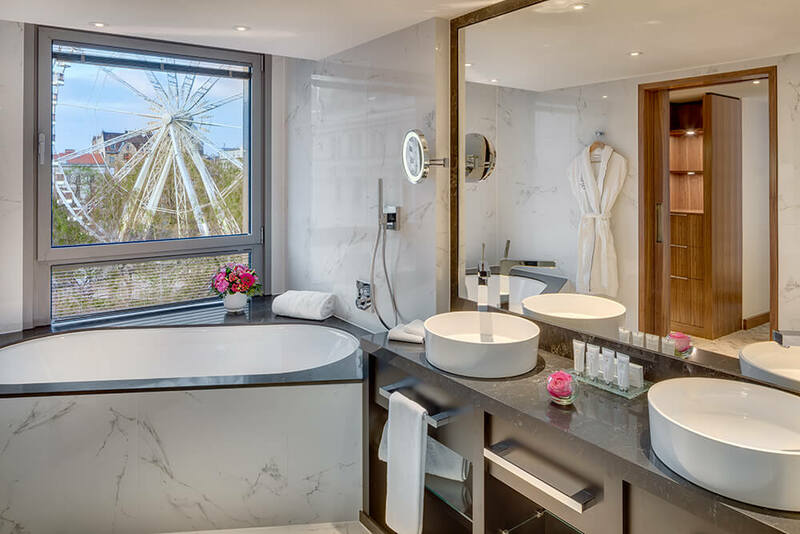 Executive Suite: The 57-square-meter Executive Suite has a gorgeous view over Budapest’s Erzsebet ter park and the Budapest Eye ferris wheel. The bedroom has a king-size bed, and is separated from a spacious living room which accommodates a sofa, coffee table, and entertainment center. The bathroom includes both a shower and a bath. The Executive Suite also has a Nespresso coffee maker and a private bar. Corvinus Suite Collection: With 5 slightly different suites in this category, each room varies in size and style. Suites range from 90- to 120-square-meters and have either a traditional/classic look, or a modern luxury aesthetic. Suites are equipped with a separate bedroom, a living room, and a bathroom with a shower and a bath. Some of the suites come with a connecting door, and suites have a Nespresso coffee maker and a private bar. Presidential Suite: The 179-square-meter suite is decorated in an Art Deco-inspired style, and offers the comfort of a separate bedroom with a king-size bed, lounge area, kitchenette, dining room, and a bathroom with bidet, shower and oversized bathtub. The suite overlooks neighboring streets, offers an in-room Nespresso machine, and has an office area with an iMac. Royal Suite Corvinus: A classically-designed luxury room, this 189-square-meter suite sits on the hotel’s top floor, offering magnificent view of the city as a result. It has a separate bedroom with a king-size bed, a spacious living room, a dining room, an office with iMac, a kitchenette, a powder room and separate bathroom with a bidet and oversized bathtub. For those in need of some ultra luxury, it also includes a 24h butler! Free high speed Wifi is available in the rooms and public areas of the hotel. If you need it, there’s also a wired Internet connection in the rooms. The hotel has elevators and provides wheelchair accessible rooms, but you’ll need to arrange to have a wheelchair-friendly room in advance. For families traveling with children, the hotel can provide a crib and an extra bed free of charge for children under 6 years old, so long as room size allows. Children between 6 and 12 get a 50% discount for an extra bed. The hotel also offers babysitting services. If you are travelling with pets (cats and dogs only), there is an extra cost of €30 per day for a pet-friendly package, which includes basket, a rug, a bowl, and a welcome treat! There are a few onsite dining options. Nobu offers a Japanese-Peruvian fusion menu, and Nobu bar offers cocktails. ES Bisztro specializes in Hungarian-Viennese dishes. The Living Room coffeehouse and ES Deli are good for quick pick-me-ups, and Blue Fox The Bar is another option for drinks. For €32 per person per day, ES Bisztro offers a buffet breakfast with traditional Hungarian options. The Living Room offers a lighter continental breakfast for €19 per person per day. Children aged 6-12 get a 50% discount at both. The hotel offers meeting and conference rooms if you need. Moreover, there is a business center which provides basic business services such as a secretary; faxing, scanning, copying, and printing; and essential office supplies. For art lovers, this hotel has its own collection of contemporary Hungarian art! You can find it displayed in the Kempinski Gallery, which offers both permanent and temporary exhibitions. If you want to take a break from the city, the hotel’s Kempinski The Spa offers various treatments, along with Finnish and aroma saunas, a steam room, an indoor pool and a fitness centre. The Kempinski Budapest is a non-smoking hotel. Room rates range between €141 and €448, depending on your choice of room type and dates of your stay. Kempinski Hotel Corvinus offers paid basement parking with 24/7 security. Expect to pay around €30 per day, depending on exchange rates. The Kempinski also offers a car wash service (paid) and free electric car charging. 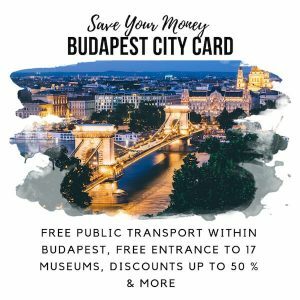 In general, Budapest isn’t a destination where you’ll need a rental car, because public transportation is excellent. 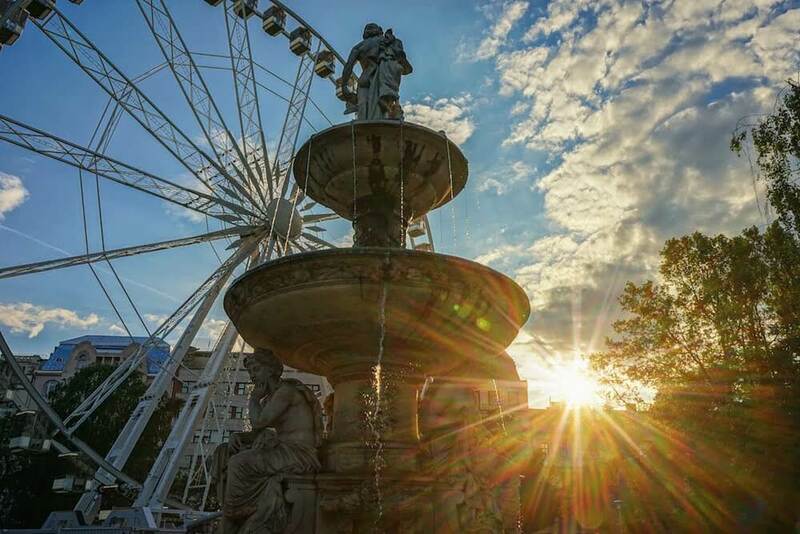 However, if you’re planning on exploring the region, or are on a road trip through central Europe, we use RentalCars.com to find the best rates and book rentals.